You are a writer who moved out of the city to clear your head and get some work done on your novel. You find a secluded cottage near the coast with the only other building in the area being an old lighthouse further down the coast line. The lighthouse is inhabited by a widowed scientist, Dr. Jeremiah Krick, and his infant daughter, Amanda. Dr. Krick is the only person you get somewhat acquainted with in the isolated area as you sporadically meet, though he remains highly secretive about his work. From time to time, you witness light of the lighthouse from the cottage, though it more appears to be Saint Elmo's fire, lasting for only a few minutes. One day, you receive a phone message from a panicking Dr. Krick, saying that something horrible has happened, that he needs to leave, and begging you to watch over Amanda. As you arrive at the lighthouse, you find out more about the doctor's work - he researches how to reduce the linear distance between planets and create a proximity point by focusing electricity on a Fresnel lens, using the power of lighting to generate a portal to a parallel world. Then, in front of your own eyes, Amanda is snatched from her cradle by a dark creature and taken through such portal. Determined to rescue both Amanda and her father, you also travel there and discover a strange world filled with sophisticated mechanical devices, a world that once flourished but has been largely destroyed and nearly uninhabited through the Dark Being's malicious actions. Through Dr. Krick's invention, the Dark Being now seems to have set his mind to inhabiting your world. The only way to stop the creature is to find seven pieces of a secret weapon, scattered around the parallel world, put it back together, and save the Dr. Krick and Amanda in time. 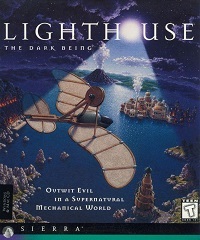 Lighthouse, designed by Jon Bock, is a sophisticated game that requires the wits of even the most experienced adventure gamer. 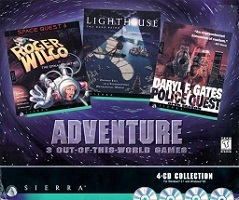 Often referred to as "Sierra's answer to Myst", the game can be completed in many different ways, following many different paths and the puzzles often have multiple solutions. There are no less than 16 different possible game endings. The unusual but rich plot and dark sound track make this game an adventure that is quite different from classic Sierra adventures, yet very enjoyable with beautiful graphics and animations and a high replay value.